Andrea Yates's horrific murders of her five small children drowning them one by one in their bathtub remains one of the most shocking crimes of recent years. In this overly detailed retelling, investigative journalist O'Malley has transformed herself in the popular current style from observer into participant, albeit with ample justification. O'Malley, who had written for TV's Law and Order, was suspicious when a prosecution witness, attempting to establish that Yates acted with premeditation, testified that the television show had recently aired an episode in which a mother killed her children and then escaped punishment by asserting a postpartum depression defense. Sure enough, no such episode was ever made, and O'Malley led the Yates defense team to rebuttal evidence that came too late to affect the guilty verdict. 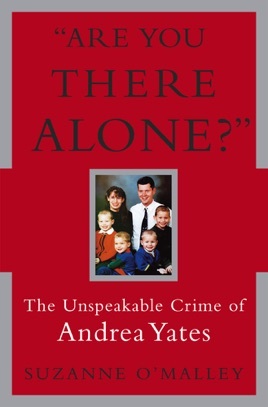 The author asserts that Yates was never properly diagnosed and relies on psychiatric opinions that claim, tragically, that a different diagnosis and appropriate treatment could have prevented her devastating actions. The writing sometimes jars ("To say this day sucked didn't begin to cover it," O'Malley says of the fatal day), but some new information and heartbreaking extracts from correspondence the author received from Yates add interest. More analysis would have been welcome, even if the nature of the murders seems to necessarily render a satisfactory understanding forever beyond human capacity. FYI:O'Malley's reporting on the case appeared in the New York Times Magazine, O: The Oprah Magazine and on Dateline NBC. I am normally a speed reader…completing a book in a day or two. If I don’t like a book it can take me about a week. The book "Are You There Alone?" took me over a month to read. There was a considerable amount of information but it was repeated and just difficult to follow. I would not recommend this book because of the difficulty following the information.